MAIN POINT: The world measures success in terms of financial profits, pleasurable gains, and worldly acquisitions. The Christian rises above the paradigms of success and failure, to begin at the cross of Christ, which is foolishness to the world, a stumbling block to many. In other words, Christians see success and failures using a different measurement. Aaron Feuerstein was a Jewish businessman. Like many, he did not enter into business to fail. He wanted to make money out of it. He desired to inject meaning in what he works. He aimed to live faithfully according to the Torah. For close to a century, his family had devoted their lives to supporting the economy in their hometown in Lawrence, Massachusetts. This company is Malden Mills, one of the largest textile companies in the state of Massachusetts. As CEO, Feuerstein was the third generation member to manage the innovative and reputable company. 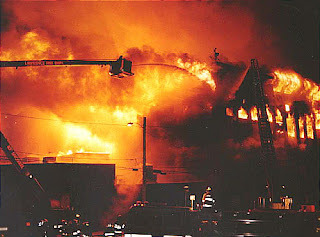 On the night of Dec 11th, 1995, the sprawling factory ended up in smoke, in one of the biggest fires ever in Massachusetts. While there were no casualties, the damage to the economy in the town was immense. Without a factory, there will be no production. Without output, there is nothing to sell and there will not be any revenues. Without revenue and work, there is no justification in keeping the 3000 employees. The fire burned up not only the factory and jobs. It burned up hopes amid a difficult economy. Basic common sense in Wall Street suggests that Feuerstein accepts the insurance money of about $300 million, retire early, retrench all his staff, and shutter the business. After all, re-starting everything is too painful. Keeping the workers is too costly. Will rebuilding the business be any good? Is Malden Mills doomed because of a fire? It is well known that all it takes is one major setback to put any organization out of business. Banks can be brought down by some unscrupulous rogue traders. The dotcom bust of 2000 reminds us of how technological companies can go from boom to bust in a remarkable short span of time. Small businesses can be swept away like the many shops during the recent Japanese tsunami. In the case of Malden Mills, it takes a fire to burn down the assets, the business opportunities, and the hopes of employees, owners, and business partners. Risk is a big factor in any business. If statistics are to be believed, in any kind of startup, most will fail. Malden Mills was no exception. All signs pointed to an eventual failure. In 1996, Feuerstein managed to rebuild his factory. Unfortunately, there was no fairy tale ending. Malden Mills filed for bankruptcy in 2001. Was this not the end? Surely it is, both for the company, as well Aaron Feuerstein’s family heritage. A person like Aaron Feuerstein is rare. Nowadays, organizations are quick to cut their losses at the first sign of negative sentiment. We hear of companies retrenching workers by the thousands simply because of a ‘change in strategic focus,’ or simply missing market numbers. We hear of businesses cutting costs just because they fail to make shareholders more profitable. We see corporations trim the budgets of long-term projects in favour of short-term gains. In the eyes of many in the first century, Jesus is a failure. He fails to organize a military uprising against the Romans. He fails to free the Jews from being enslaved to the foreign powers. He fails to muster up more hurly burly musclemen and commandos. Instead, only has a rag-tag group of 12 novices, most of them fishermen, hardly able to make any dent in the country’s establishment. Most tragic of all was Jesus, the Master Teacher dying miserably at the cross. In Jewish and Gentile eyes, the cross is the culmination of a sad story of a folk hero without a ‘happily-ever-after’ ending. Until we read about Jesus’ disappearance from the tomb. Until we hear witnesses proclaiming they saw Jesus appearing to them. Until we read about how the Holy Spirit moves thousands to testify that Jesus is alive! Something is growing, and growing fast. In 1 Thessalonians, Paul writes to the Church to encourage them in the proclamation of the gospel. Despite all their good works and intentions, Paul and his followers suffered and were mistreated at Philippi. Becoming a Christian is not profitable to the wallet, but painful as many took beatings from all over. Yet their faith remain alive. They may suffer for their faith, but their faith never suffered. In contrast, many modern Church goers are not suffering for their faith. Instead, they are largely discontented with what they have. The scary thing about such books is that it contains half-truths here and there. Instead of the pure gospel, it is the ‘prosperity’ version of a worldly gospel. Words like ‘success, ‘prosperity,’ ‘successful,’ ‘good,’ ‘positive’ are often used. Very rarely is there a reference to Jesus Christ and the cross. In fact, do a word count in Your Best Life Now, and you can see how the word ‘success’ overwhelm any mention of the cross of Christ. While preachers like Osteen and Hagin prefer to deal with the results of the work of Christ, we need to remember that we all have to begin at the cross of Christ. The disciple of Christ is no friend of worldliness (Titus 2:12). The gospel tells us to be prepared to suffer (James 5:10). Hebrews reminds us that suffering perfects our salvation in Christ (Heb 2:10). Simply put, the Christian is reminded that the measurements for success cannot be simplistically done in worldly terms. It cannot be measured in dollars and cents. We are told that obedience to the Word of God will lead us in the paths of righteousness. This is beyond economic or pagan theories of success and failure. The disciple of Christ is called to follow Christ, regardless of success or failure. My friends. Beware of the insidious temptations of success. In our efforts to be successful, let us not lose sight of the Cross of Christ, which is foolishness to the Greeks, and a stumbling block to the Jews. Let us keep our eyes focused on the goodness of God, and the love of Christ. If Jesus has suffered for our sakes, He has set forth an example for us to suffer for other’s sakes. This is true success. Let us live faithfully in the gospel. Let us walk fearlessly to practice Christlikeness in the world. Let us always put people before money, instead of money before people. Otherwise, we may hear the following haunt us over and over again. Remember, in every ‘failure,’ there is a silver lining. Catch that glimmer of hope. Grab at the hanging line of opportunity. Step out in faith. God does not promise us a path strewn with roses. His solemn promise is that He will be with us, all through the end of this age. That is indeed more valuable than any worldly ‘success.’ Thankfully, we have people like Aaron Feuerstein, though not a Christian, showing us the way that one can be successful in God amid failure in the world. Feuerstein may have become a bankrupt, but his conscience is clear. His faith is strong. In his failure, he brings hope to many. Those he had known, and many he had not known.